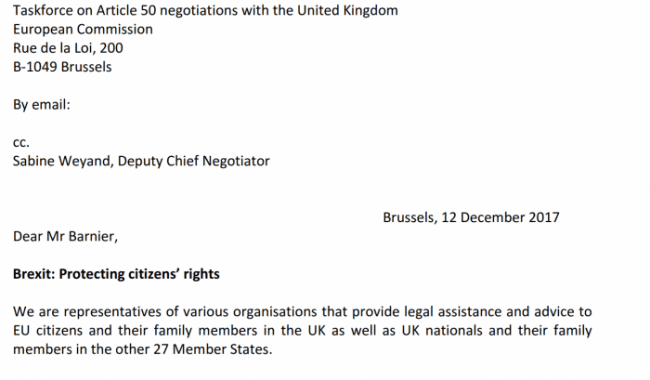 Today, as part of the EU Rights Clinic, ECAS has submitted letters to the European Commission’s Taskforce on Article 50 and the European Parliament’s Brexit Steering Group to express concerns about the protections granted to the rights of EU citizens and their family members and carers living in the UK following the recent agreement reached by the UK and EU to conclude phase 1 of negotiations. The EU Rights Clinic also seeks assurances over the interpretation of “lawful residence” under EU law and that inactive EU citizens will not be required to have held “comprehensive sickness insurance”. The letters have been submitted on behalf of 34 signatories, including ECAS’ Executive Director Assya Kavrakova, representing various organisations providing legal assistance and advice to EU citizens living in the UK and British nationals living in the the other 27 EU Member States. If you are an EU citizen in the UK and are having problems exercising your rights, please contact us at rights.clinic@ecas.org.